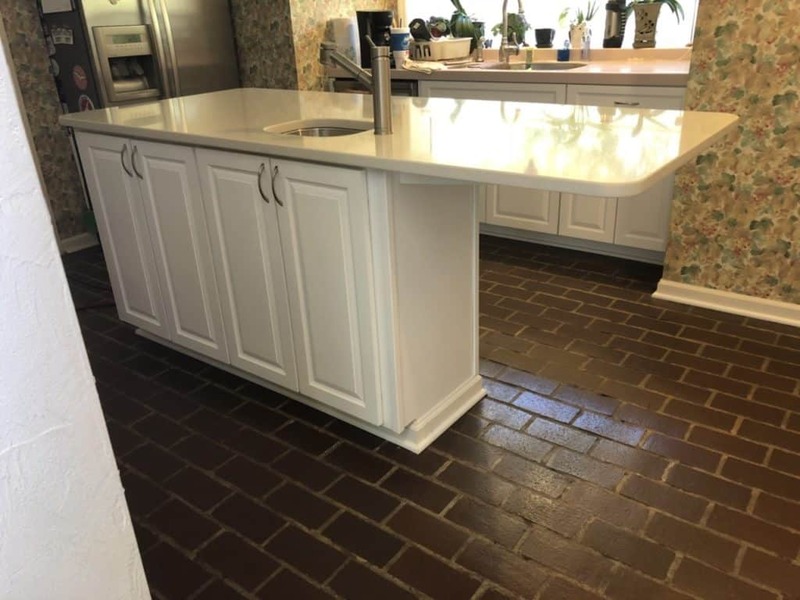 A recent cabinet reface project in Betton Woods, Tallahassee. 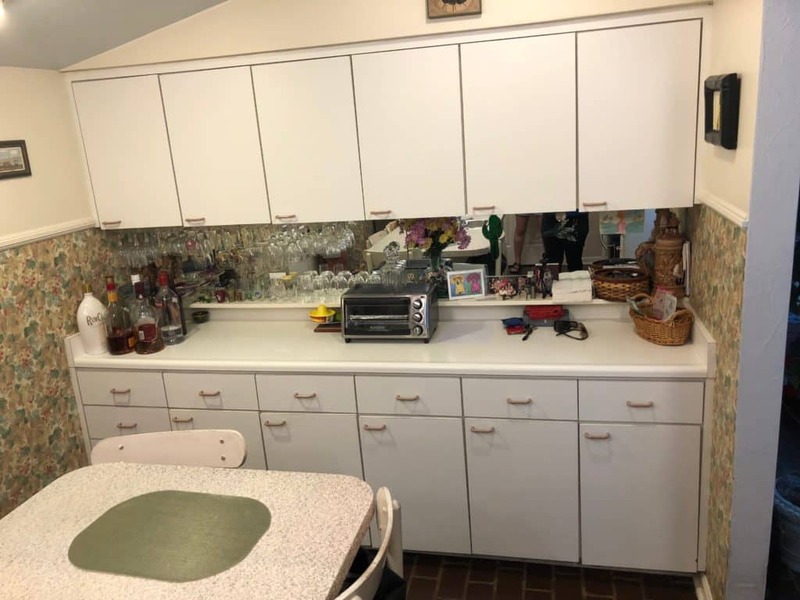 The cabinets were originally installed by the architect who built the home and they were quite unique. 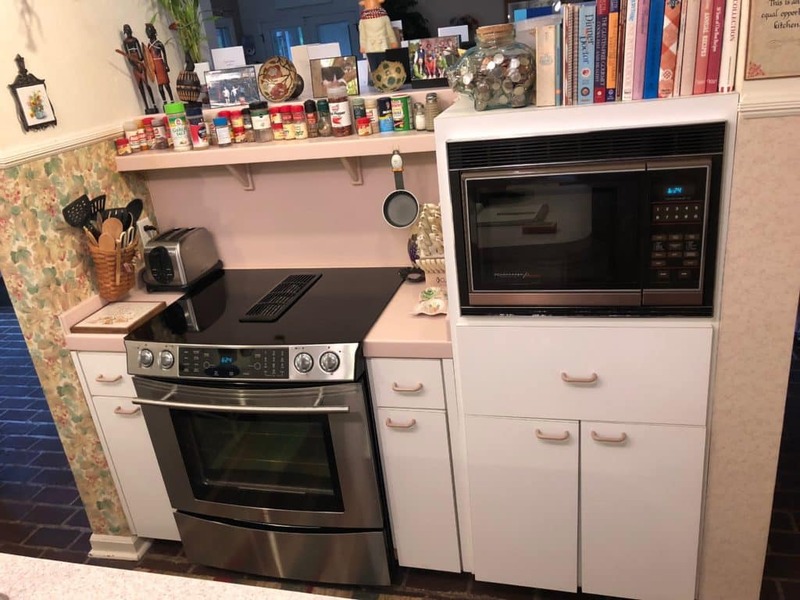 The couple who owns the home now really liked the kitchen layout but the cabinets doors were starting to sag and the laminate on them starting to peel. 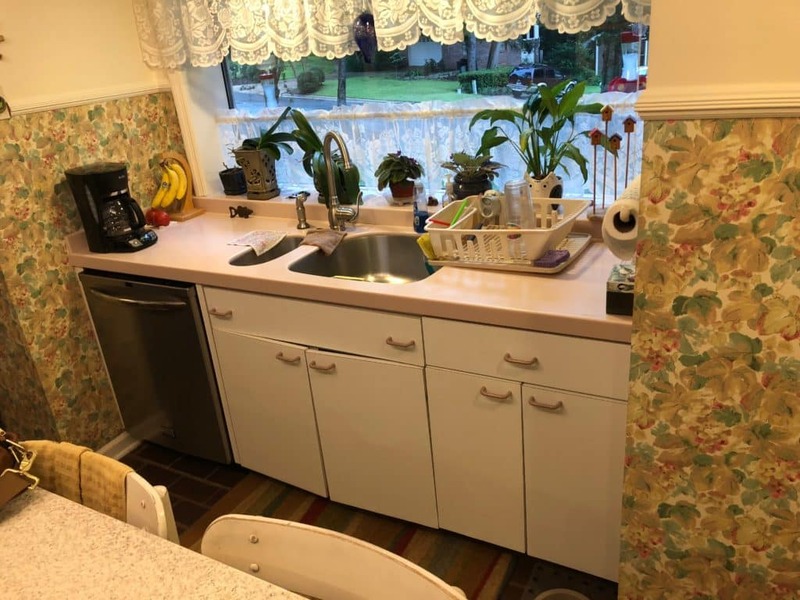 We refaced the kitchen with new doors and drawer fronts. 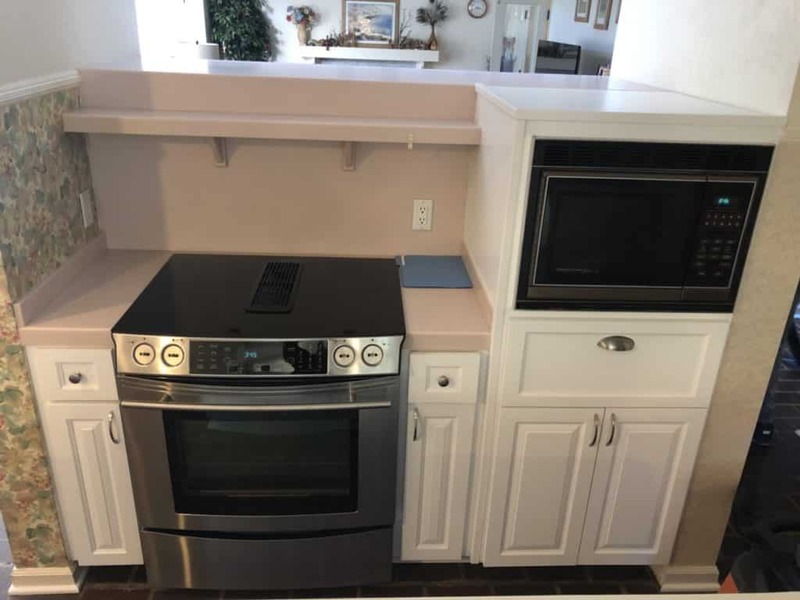 They chose arched top doors for their upper cabinets and a raised panel door for the base cabinets. 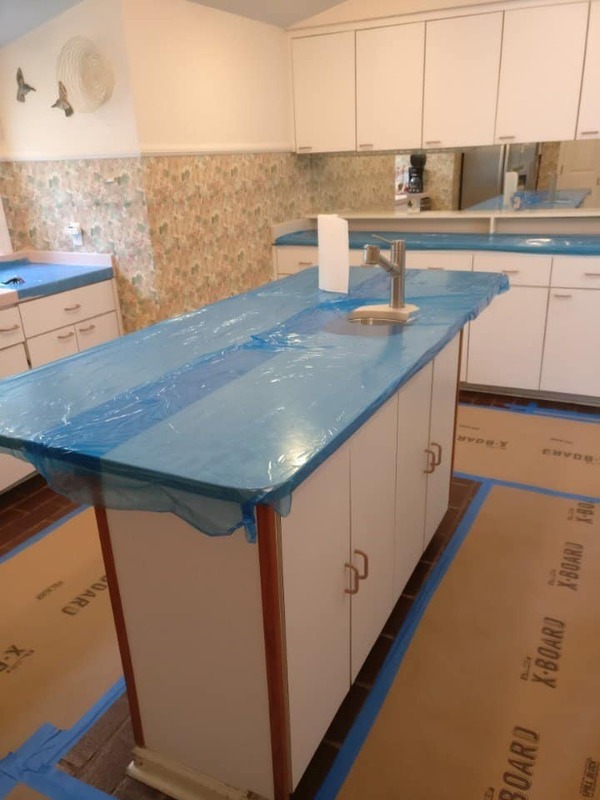 They They had their countertops replaced prior to the start of the refacing project. The cabinet doors prior to the reface were slab doors with white laminate. The hinges were old and many of the doors sagged or would not close properly. 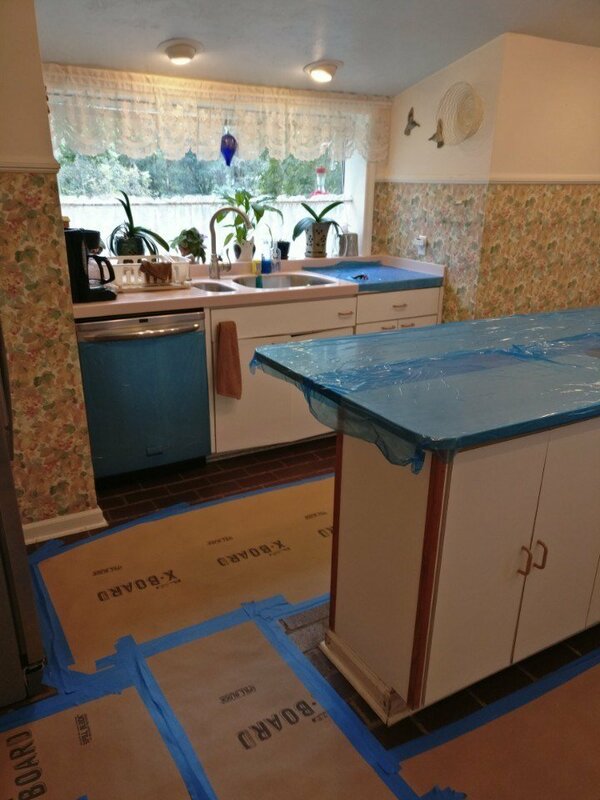 On day one we protected the floors with thick cardboard (Ramboard) and applied a protective film to the countertops. Then we removed the existing doors, drawer fronts and trim are removed and the cabinets are lightly sanded. On day two we applied 1/4 panels to the cabinet boxes and face frames. Day 3 we edge banded all the door openings and installed the trims. On day 4 we installed all the new doors and drawer fronts, and new cabinet pulls. Our client decided to stick with white cabinet doors and drawer front as they wanted a neutral backdrop. 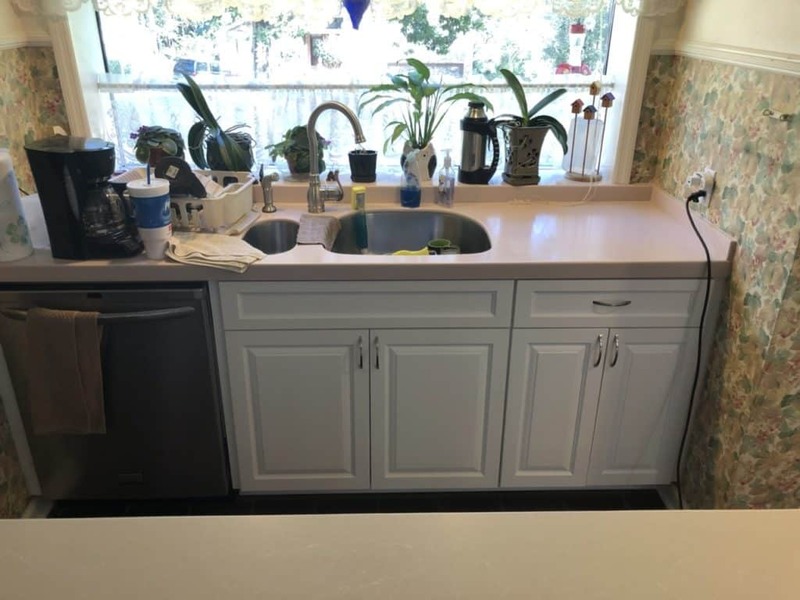 The replaced the countertops on the island and buffet area but kept the old tops around the sink and range. 4 days for the refacing. 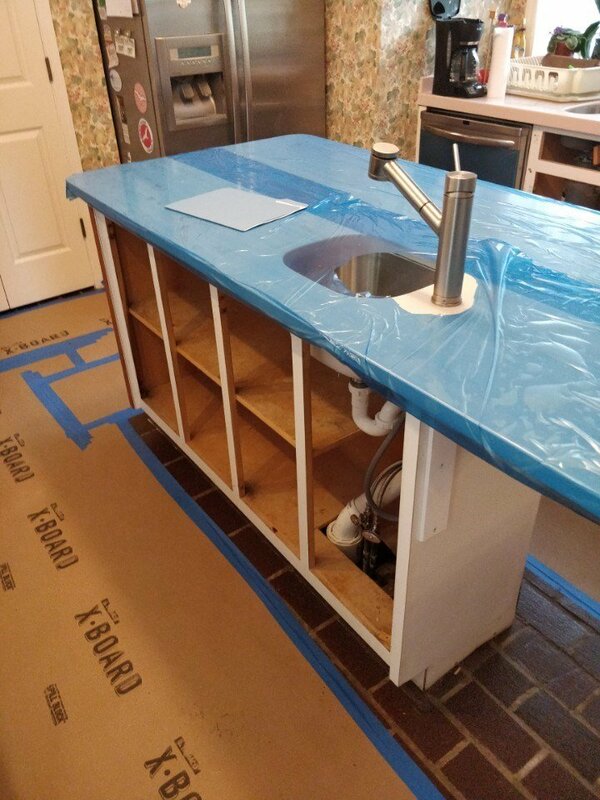 During the removal of the old cabinet doors and drawer fronts we discovered the base of the island was rotted. There had been a slow leak in their prep sink. We manage to rebuild the base and once the cabinet was refaced you’d never know the repair was there. As always the greatest success is that our client loves the new kitchen. 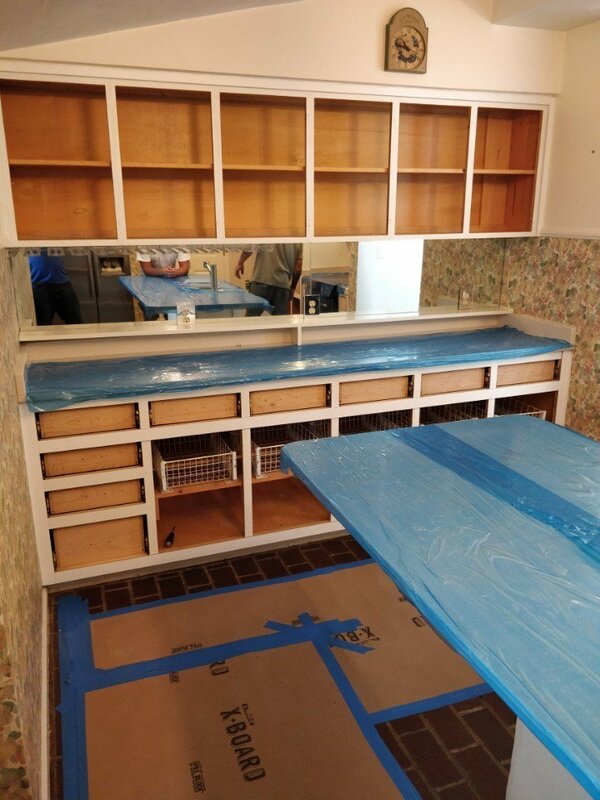 One benefit of the reface was that we were able to deepen their upper cabinets by an inch. 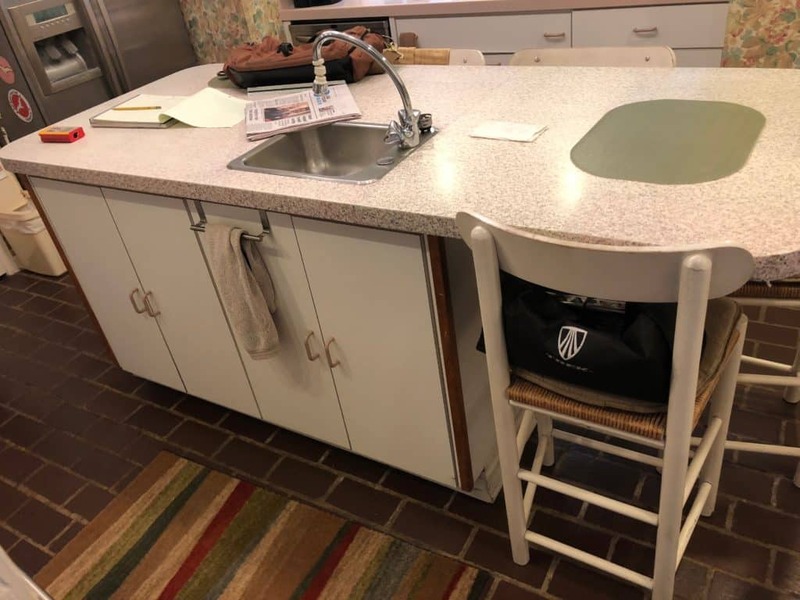 The old cabinets were only 11 inches deep which made it difficult to store dinner plates. 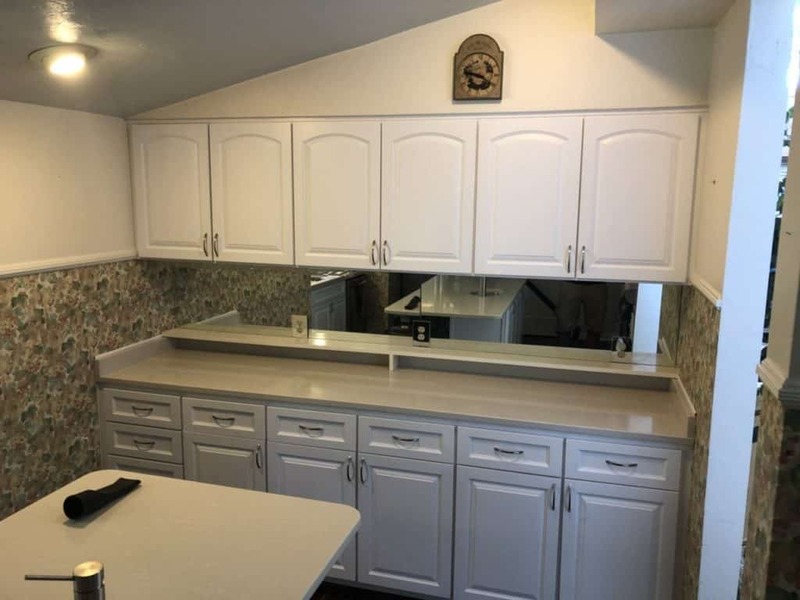 The new refaced cabinets will store the plates without any issue.